I had such high hopes for the Advent Calendar. This was going to be the year that I Got It Together in time for Christmas, The Making of the Calendar the first of many daily Christmas-related activities I hoped to accomplish. When the kit arrived (all the reviews cheering in my head how Simple! Quick! Easy! and Fun! this was going to be), its precut adhesive-backed components ready to be affixed to the pocket-lined Christmas tree, we cleared the table. 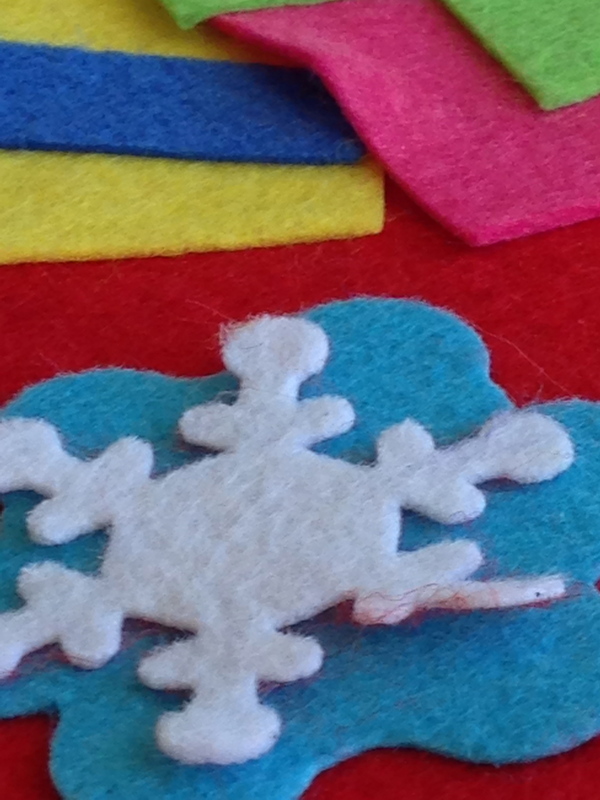 The four-year-old immediately took over, carefully studying the accompanying diagram and applying the brightly colored felt pieces exactly as the example showed. For an hour, I felt the blessed peace of unhurried being, as he worked and I admired his focus. Then, he was ready to move on to something else, and we set the materials aside to finish later. He pulled the whole assembly out several times over the next two days, each time for shorter sessions, and each time, leaving ever-increasing piles of felt stickers and scraps in his wake. I tried to ignore the voice in my head: if you were a better mom, you wouldn’t let him leave messes like this. If you were more organized, this would be done already. You should be more in control of this project. Despite my attempts to counter argue, recognizing it as my own anxiety rearing its head, I nevertheless became more stressed with each day that we weren’t Finished-With-The-Calendar-So-We-Can-Celebrate-Advent! We were into the second row of pockets by now, each passing day a reminder that I so didn’t Have it Together. Behind again. I’m always feeling behind, a need to hurry and catch up, to do more. That I don’t measure up, that I haven’t accomplished enough. But the One Whose coming this season of Advent anticipates? His time is relaxed. Unhurried. He had no problem with taking the time to gestate, starting his mission as a zygote and spending His first nine months of humanity simply being. Content with receiving the love and nurture of a young mother, existing His only accomplishment. When the Eternal One wove Himself into the fabric of time and space, He seemed to bring with Him His Outside-of-Timeness, as though, while choosing to be contained in a body, He nonetheless refused to be enslaved by Time. For someone who didn’t start His ministry till the age of thirty and knew that He would only have about three years to accomplish His mission on Earth, He never allowed Himself to be rushed. Contrast this with my constant anxiety to hurry and do more, to prove my worth, my value, by producing something. Look at the essay I finished! Look at the clean dishes! Look at the pounds my baby has gained! Look at my blog! This! I’ve produced this! My life was of worth this day, because I accomplished, produced. Christ’s example to us, though, especially in this season, is simply to be. To wait for His Father’s perfect timing. To become like an unhurried child, whose greatest “accomplishment” is receiving the love and care of the Heavenly Father. The calendar is mostly finished. Maybe someday I will cut out some felt numbers to fill in the ones that are missing. But for now, it’s a reminder to me that the state of being is more important than the product. That, for over an hour, my son and I were patient with each other. That he exercised his focus and his stick-with-it muscles, and I exercised my let-him-figure-it-out muscles. That we were together. That, for an hour, we relaxed into the holy unhurry of this season of Advent.